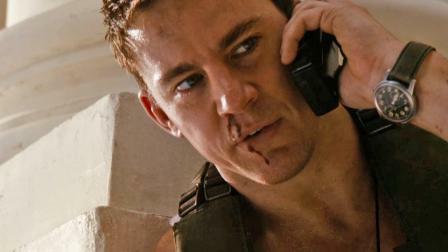 I expected White House Down to be basically the same movie as Olympus Has Fallen (2013). Besides the actors, almost everything about each film looked very similar. It is very weird to me that two movies that are so much alike would be released the same year and so close to one another. 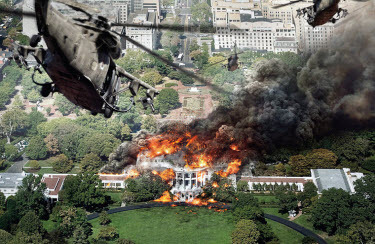 For some reason I got it in my mind that White House Down was going to be the ugly cousin of Olympus Has Fallen. 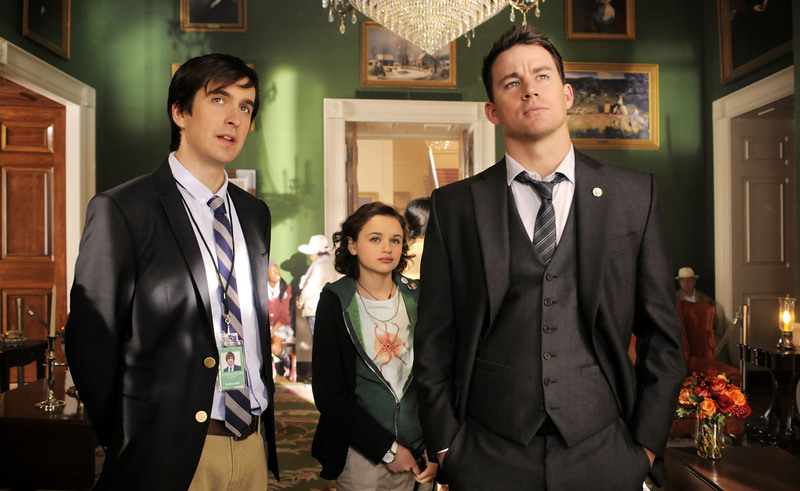 White House Down follows a former military man (Channing Tatum) who brings his daughter with him to the White House where he managed to get a job interview to try to become a Secret Service Agent. He brings his daughter along with him to the White House because she is a huge fan of the President (Jamie Foxx). While there, they decide to take a tour. During the tour the White House is attacked and the man does what he can to protect his daughter and the President. The film was directed by Roland Emmerich and the rest of the noteworthy cast includes Maggie Gyllenhaal, James Woods, Jason Clarke, Richard Jenkins, Joey King, Nicolas Wright, Jimmi Simpson, Michael Murphy, Rachelle Lefevre, Lance Reddick, Matt Craven, and Kevin Rankin. This movie surprised me. It exceeded my expectations. I liked it a little bit better than Olympus Has Fallen. It was not quite as predictable as Olympus Has Fallen and I felt that the actors did a better job. 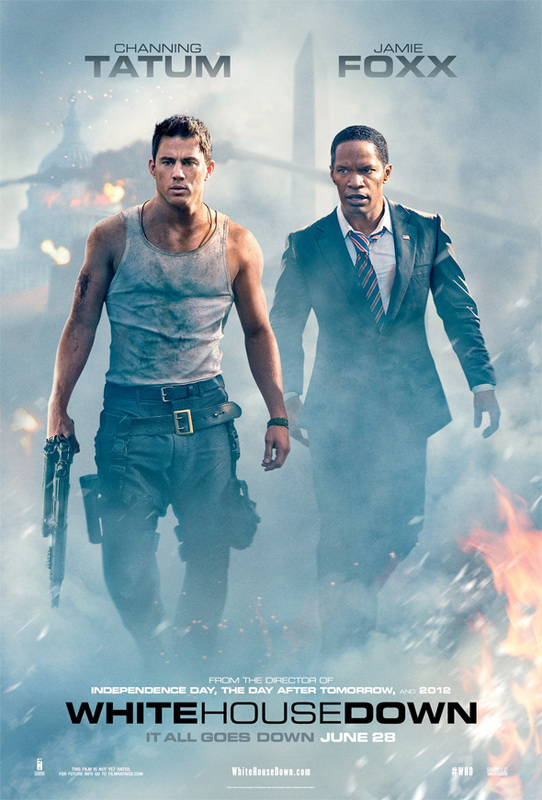 Also, it seemed like White House Down had fewer flaws than Olympus Has Fallen. The film was intense and exciting. The attack on the White House was eerily realistic. There was a lot of good action. As with most action movies, some of the action was a bit unbelievable at times. But, for the most part, this didn’t take away from the film. Tatum was likable as he usually is. Foxx was better than I thought he would be as the President. When the two teamed up together, they were both pretty entertaining and even funny at times. The rest of the actors played their parts well. Besides Tatum and Foxx, Woods and Jenkins stood out above the rest. 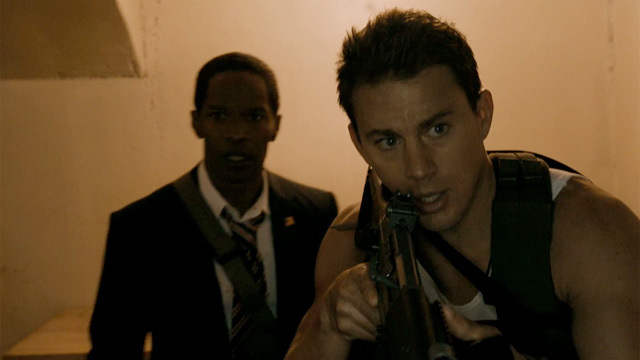 Overall, White House Down is a fun ride worth taking. Posted on July 17, 2013, in Action Movie Reviews and tagged A Guide to Recognizing Your Saints (2006), Channing Tatum, James Woods, Jamie Foxx, Jason Clarke, Jimmi Simpson, Joey King, Kevin Rankin, Lance Reddick, Maggie Gyllenhaal, Matt Craven, Michael Murphy, movie, Nicolas Wright, Olympus Has Fallen (2013), Rachelle Lefevre, Richard Jenkins, Roland Emmerich, White House, White House Down (2013). Bookmark the permalink. 2 Comments.